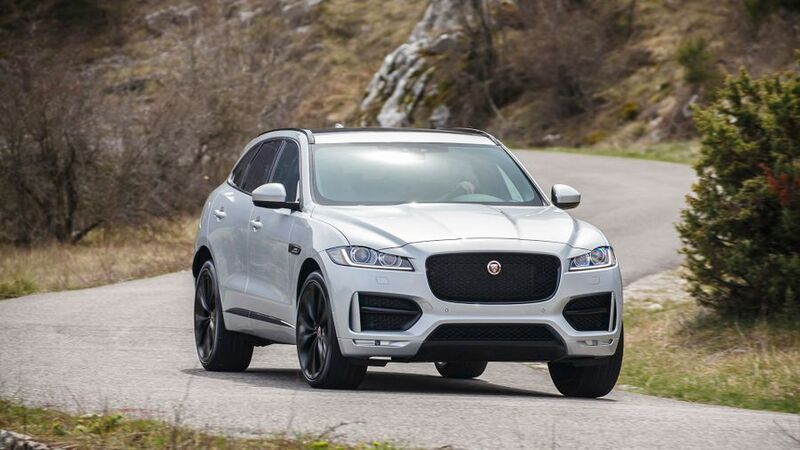 The Jaguar F-Pace can rightly claim to be one of the sportiest and best-looking SUVs on the market. It's handsome, practical, and surprisingly cheap to run when fitted with a 2.0-litre diesel engine. This might be the brand's first ever 4x4, but Jaguar has borrowed technical know-how from sister brand Land Rover and the result is a car that feels rugged off-road and comfortable - yet poised - on it. A real class contender. Huge performance, matched by a huge standard spec list, and sporty looks. Better than the V6 petrol. One of the biggest reasons SUVs are now so popular is the image they project: they look tough, expensive and impressive - whereas an estate car merely looks practical. However, with so many 4x4s now flooding the market, standing out has become a real priority. Jaguar knows this, and in the F-Pace it has made a car that really will stand out when parked next to its ultra-conservative rivals from Audi, Mercedes and BMW. This car borrows lots of its design flourishes from the gorgeous F-type sports car, with a long bonnet, sharply tapered taillights, and a wide oval grille at the front. As the name suggests, the mid-range R Sport versions are the most extrovert, with 19-inch alloy wheels (22-inch rims are an option) lots of badges dotted around the exterior and a sportier body kit, plus LED running lights. Standard models are less bold, but still get alloy wheels, satin roof rails and a powered tailgate. 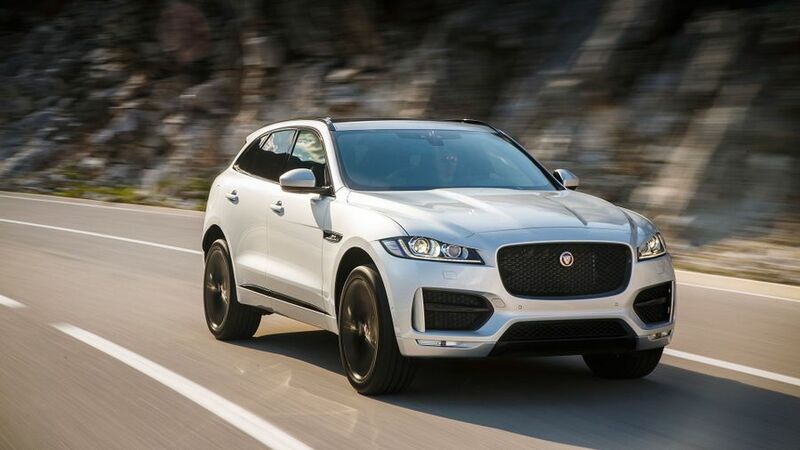 Jaguar has positioned the F-Pace as an SUV for those who enjoy driving, and the interior reflects that, with a wraparound dash and low roofline that makes it feel instantly sporty. You sit quite low for an SUV, too, but the driving position is decent, and with electrical adjustment for the backrest standard on all models, getting comfy behind the wheel is no chore. When you do, you'll notice a cabin design that mirrors that of the XE and XF saloons. It's relatively neatly laid out, but many of the buttons and switches can feel flimsy to the touch, while in certain areas (like the instrument cover and door panels) the plastics are hard and scratchy. 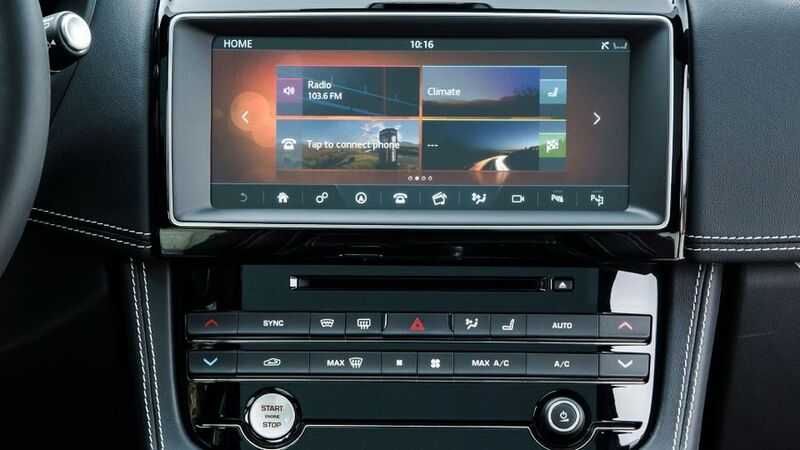 Every F-Pace gets an 8.0-inch touch-screen infotainment system called InControl. It's got a wide variety of functions, and comes with sat-nav, but the graphics are low-res, and it's not the snappiest to respond to commands from the driver. All-round visibility is decent, but you'll be glad of the standard parking sensors when it comes time to reverse into a tight space. The F-Pace has a larger on-road footprint than many of its SUV rivals, and that extra space has gone to good use, making it one of the most practical cars in its class. It might not have the seven-seat flexibility of the Land Rover Discovery Sport, but nevertheless a 650-litre luggage capacity, stretching out to 1,740 litres with the rear seats folded, means you'll be able to carry plenty of luggage. Those seats split in a useful 40:20:40 configuration, and as an option you can fit a pair of plastics levers so you can drop the seat backs from the boot. 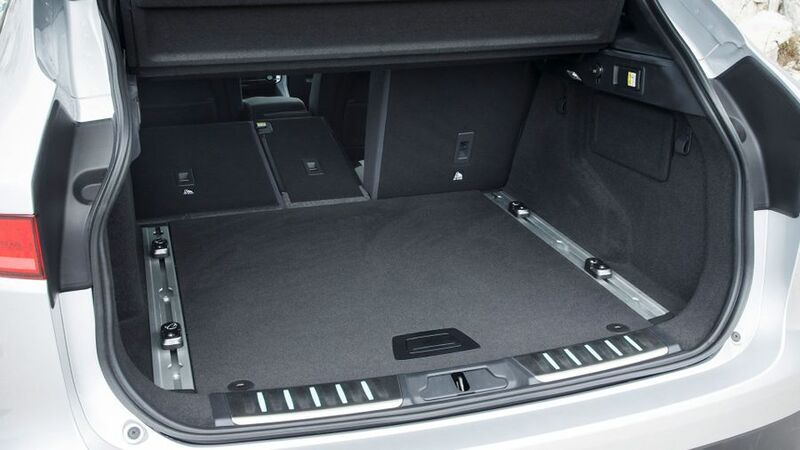 The load bay itself is wide and almost totally flat, so pushing bulkier items deep into the car should be simplicity itself. As for passengers, those in the back are well catered for, with lots of head-, leg- and elbow room. The narrow rear windows do make things feel a tad cramped in the back, though, while you have to lift yourself over the wide wheel arches to climb inside. The boot opens at the touch of a button (a standard feature) and you can even buy a special activity wristband, which locks the car with the keys inside, and is waterproof - perfect for trips to the beach, or any outdoor activity where you'd rather not carry your car keys along with you. The F-Pace is genuinely thrilling to drive, with a wonderful sense of a connection to the road that is sorely missing in the majority of high-riding SUVs. The steering is precise, nicely weighted and consistent in its responses, while the four-wheel drive system sends most of the power to the rear wheels, helping to push you out of corners and giving the F-Pace a fine sense of balance and composure. It's also lighter than its rival 4x4s, including the Porsche Macan. You might expect that this sure-footed nature comes at the expense of ride comfort, and to an extent, you'd be right. There are two suspension setups, one with steel springs, and one with more sophisticated adaptive setup. The latter is fitted as standard on top-spec models, and does a fine job of isolating those on board from any lumps and bumps you might encounter in the road, while maintaining taut body control. There is still quite a firm edge at low speeds though, and on standard springs and with larger alloys, the F-Pace could be a bit too harsh for some - your passengers might not enjoy being jostled around as the car hits speed bumps and potholes. There is quite a stark contrast in performance between the various engines in the F-Pace. Most buyers will opt for the 2.0-litre diesel, which has 178bhp, and can be had with either a six-speed manual gearbox, or an eight-speed automatic. We would strongly recommend, if you can afford it, to go for the auto’, which is smooth and helps the engine feel less strained. The car is brisk enough in this form, too, but the engine can occasionally feel a fraction underpowered in such a large car. That's reflected in a 0-62mph time of 8.7 seconds. Those searching for a bit more speed will be well served by the excellent 3.0-litre V6 models. The diesel has 296bhp and massive mid-range grunt, so it feels gutsy and effortless at all times, while also being smoother and less harsh than the 2.0-litre when worked hard. The 3.0-litre V6 petrol is even quieter, but emits a purposeful howl from the exhausts in the sportier driving modes. Still, it actually feels a bit less punchy than its diesel counterpart on the motorway, and when getting up to speed. The only trouble is that these six-cylinder models are very expensive, and rivals such as the Audi Q5 and Mercedes GLC both offer quicker, cheaper alternatives to the 2.0d. The F-Pace is a refined motorway cruiser, but the four-cylinder engine can get quite noisy and intrusive when pulling away, with the gearbox holding it at high revs. Much like their relative performance, there is a big difference in how much your F-Pace is likely to cost you depending which engine you decide to go for. The entry-level 2.0d will be the pick for company car buyers, as its 129g/km CO2 emissions drop it into a very affordable BIK tax bracket while an official combined fuel economy of close to 60mpg is one of the best in this class. However, if you want four-wheel drive, that figure rises to 134g/km, and adding the automatic gearbox pushes those emissions levels higher still. Even so, rock-solid residual values - particularly on the desirable R Sport models - lower than average insurance groups, and affordable servicing packages all take the sting out of the cost of ownership. If you want the performance and luxury of the high-spec V6 models, then you'll also have to swallow the increased running costs, and they cost around the same as bigger cars like the Audi Q7 and Volvo XC90, whether you're buying or leasing. The V6 diesel is still reasonably efficient, but the petrol is best avoided, with a CO2 output of 209g/km, real world economy that'll hover in the low twenties, and much higher insurance than the standard models. This is a brand new model for Jaguar, with plenty of bespoke technology, so there might be a cause for concern, but it's far too early to know if the F-Pace will be a reliable companion. It does share some of its mechanical and electrical technology with the XE and XF saloons, but it feels better built than both inside, so we're hoping that Jaguar has been steadily improving the quality of these parts over time. The infotainment system did still seem a bit bug-ridden on the early cars we tested, and again, this is something we hope will be ironed out for customer cars. Although the model is too new to feature in any reliability surveys, Jaguar as a company does better than most other premium brands in the charts, outranking Audi and Mercedes-Benz, but not BMW. As standard, it gets a three-year unlimited-mileage warranty, which owners have the option of extending to cover five-years or 75,000 miles on the 2.0d model. A five-year servicing pack is also really affordable, cutting the cost of ownership. The F-Pace scored the maximum five stars in crash tests by safety organisation Euro NCAP. It has an impressive array of standard equipment, including automatic emergency braking at low speed, traffic sign recognition so you know what speed you're supposed to be going, and lane departure warning system to stop you wandering out of line on motorways. Traction and stability control, anti-lock brakes and ISOFIX mounting points are of course all fitted as standard, along with six airbags. The options list includes a tiredness monitor for the driver, sensors to help with reversing out of the driveway, 360-degree parking cameras and blind spot monitors. There's also a head-up display that projects key driving information onto the windscreen, but it's expensive and not as clear or easy to read as rival systems. 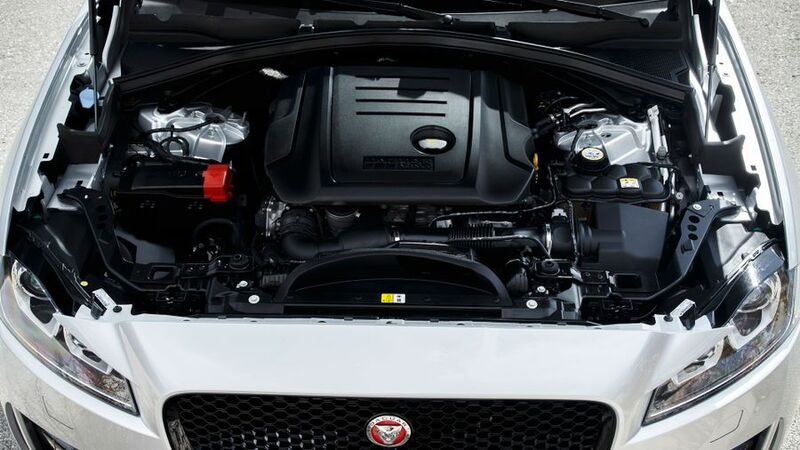 Jaguar offers a considerable amount of standard equipment, regardless of the trim you pick. That means even the entry 'Prestige' model comes with heated leather seats, climate and cruise controls, sat-nav, DAB radio, front and rear parking sensors, and keyless start. Step up to the R Sport model and you'll get visual upgrades, larger wheels and Xenon headlights. The priciest Portfolio version rewards your extra financial outlay with luxury kit including a panoramic glass roof, softer leather, a heated screen, fully electric seats, power-folding mirrors, a reversing camera and a powerful Meridian sound system. Worthwhile options include the InControl Touch Pro infotainment system, which features a larger 10.2-inch screen, better sat-nav and 10GB storage drive, the Practicality Pack and a full-size spare. If you want an SUV that doesn't compromise on style or driving dynamics, the F-Pace is the one for you. It'll still do all the things you want from a family 4x4, like swallowing a load of suitcases or traversing a muddy field or icy driveway, but also combines fine handling and ride comfort like few high-riding cars can. Better yet, it's also generously equipped and - in the right spec - affordable to run. The 2.0d is competitive with all its major rivals, but the V6 models are by far the pick of the range, which is why it's a shame that they're so expensive.